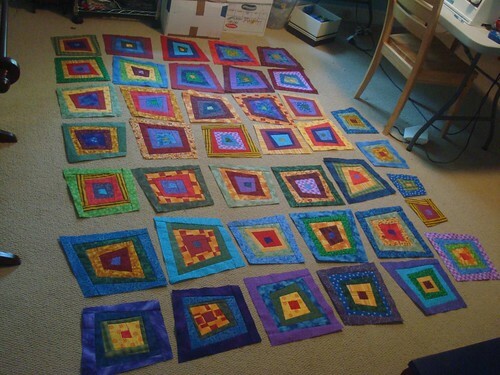 I'm still plugging away on my Wonky Rainbow Squares quilt. Looking at my previous posts, my last update we while I was still working on the blocks. I finished all of the rainbow blocks at the end of April (hooray!) and set about trying to figure out how to arrange them. I decided that I wanted to create a similar layout--a cohesive border around the blocks, linked together, on a solid background. I had initially wanted to use grays or browns for the border and background, but I didn't have much of either color in my stash. Staying true to those (and being budget friendly) meant working with what I had, so I took another look, this time looking to see what I had the most of. I discovered two fabrics--the black I used for sashing in the turtle quilt and a navy blue with "stars" that I used as the binding for Blue Clear Sky. In both cases, I had wanted long uninterrupted strips, so I had bought a fair bit of yardage, figuring they were fabrics I would use elsewhere. So far, the plan is to use the black to border and connect the blocks and the night sky as the background. I'm not sure that I will have enough of the night sky, depending on how spread out I want the blocks. 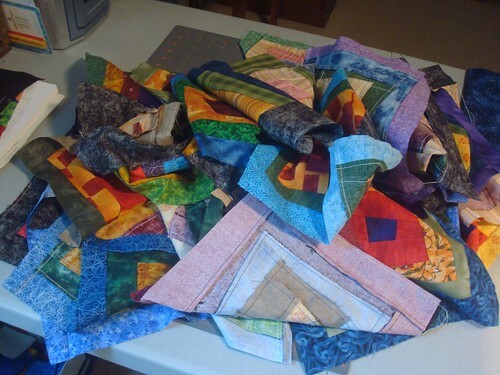 I'm also not sure that these won't end up being more than one quilt. Right now, I'm working on getting the blocks bordered, then I will lay it out and make some decisions on size, spacing, etc. 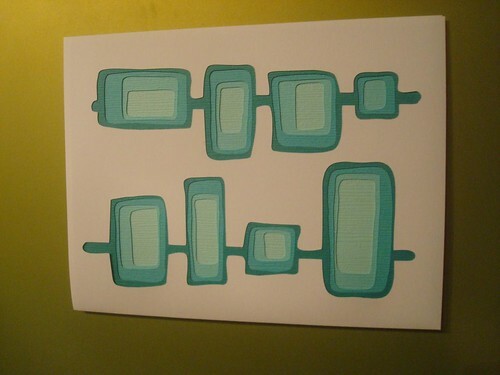 Last weekend, I ironed the fabric, cut strips of various sizes, and got one side of all the blocks (all 40) bordered. This weekend, I got another side attached. I'm hoping to have more progress on this project before starting my summer of handstitching. Which means I'd better get in some evening sewing this week! Your updates on your WRS quilt really makes me want to start one of my own! Thank you! I think that is one of the highest compliments I could get. : ) I always like seeing other people's take on the same idea. It fascinating different the "same" quilt can be.